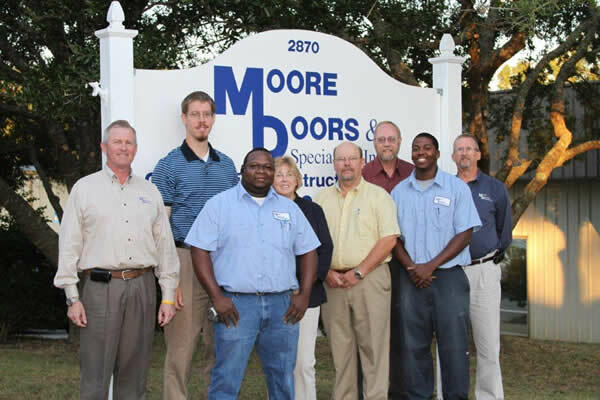 Moore Doors had it's beginnings in 1995 when John Moore, then working in Tallahassee as an estimator and project manager, was approached by the general manager of Holmes Architectural Door and Hardware with an offer to open and manage a branch office of that company in Tallahassee. John perceived this as a great opportunity to put his 20 plus years in the door and hardware industry to the test and quickly accepted. With the hiring of brother Greg Moore, who had solid construction sales experience in addition to a loyal customer base, quickly followed by the hiring of hollow metal and installation expert David Fraser who was brought in to set-up a hollow metal shop and train shop personnel, as well as call on end-users, the branch was soon in high gear. By focusing on small, profitable jobs with an emphasis on service, Holmes Architectural Door and Hardware-Tallahassee, soon developed a loyal and ever-broadening customer base. In early 1998, following the death of their mother and sole remaining parent, John, Greg and sister Elaine Yawn decided to use their inheritance to honor their parents by starting their own business. Following several months of negotiations, a deal was struck with their former employers to purchase the Tallahassee branch office, and on December 1st, 1998, Moore Doors and Specialties, Inc. came into existence. With the hiring of Steve Schans, a highly-respected and experienced estimator and project manager in the spring of 1999, followed by the hiring of sister Elaine as book keeper and office manager in the fall of 1999, the core management and sales team was complete and remains intact to this day. We understand that past performance doesn't guarantee future results, and that what has worked in the past may not work today. Bearing that in mind, we will continue to examine all facets of our business with an eye to improving efficiency and customer satisfaction without sacrificing the importance of face-to-face communications with our customers. Provide quality construction materials efficiently and fairly priced to our customers; and to respond quickly and with a positive attitude to any of their concerns, recognizing that our success is dependent on their satisfaction. Create and maintain an environment for our employees that is clean, safe, and well-equipped; and that develops, encourages and rewards self- motivated individuals and helps them achieve their potential, recognizing that our employees are our single greatest asset. Demonstrate a commitment to our faith in Jesus Christ and an adherence to Christian Principles and Ethics by dealing fairly and honestly with employees, customers, suppliers and all others with whom we come into contact, and by generously sharing our good fortune with the unfortunates among us; recognizing that our success is dependent on God's grace and that we are but stewards of his company.